As social media and online partner for Architecture ZA 2012, we’ll bring you highlights from our Biennale experience through the eyes of two young architects-in-the-making, Brett Petzer and Robert Bowen. The Morning light seemed intent on showing off the city to best advantage on the first morning of the Architecture ZA Biennale. LIght gleamed off the glass was lost in the recesses. I thought to myself how appropriate this was as I biked into City Hall in a slight, bracing chill. First to speak were Basil Jones and Adrian Kohler of Handspring Puppet Company – the people who have won a mantlepiece full of mainstream awards in an unlikely art form – who compared the design of buildings with that of puppets. What at first seamed a slight metaphorical stretch went on to become a convincing and even enlightening presentation. When one considers that puppets are carefully designed sculptures that perform in a space for designated audiences, the Handspring puppetmasters’ insights were easily applied as professional critique in the realm of space-making. The Handspring speaker emphasised the power of restraint in design. When it comes to creating the desired effect in the audience’s mind, aiming for less, and less concretely, creates freer impressions in the viewer (or building user) and engages the viewer-visitor’s mind more fully and on a more equal footing. Another salient point made by Jones and Kohler is that spaces, like puppets, are dead until animated. It in only in the interaction between puppeteer and audience, or architect and public, that the theatre actually happens or is performed. Realising that we all perform buildings is a big moment in the budding architect’s intellectual life, and this is an idea worth spreading to everyone. Whether one subscribed to the puppetry-as-architecture metaphor or no, the haunting War Horse excerpt at the end (a major London theatre hit set in the First World War) was a resonant reminder of the simple power of puppetry to mimic, and then exceed, the pathos and drama of real life. The second speaker on our Future Cape Town wishlist was Robert Silke, an established maverick and former enfant terrible who presented us with the stage set of a science fiction series from the 1980s. We saw Cape Town filled with strange and fantastic skyscrapers. Robert went on to lament the loss of the CT that never was. He explained how building conservation in Cape Town has become an outlet for conservativism. He also drew attention to the fact that Cape Town remains beautiful despite its poverty of good design, referring especially to the forced removals of the Group Areas Act and other deadening outcomes of our national experiments in social engineering. Silke’s talk was followed by a debate between some old hands in the architectural discourse: Jo Noero, one of the great lions of the South African discourse; Edgar Pieterse, a veteran critic and academic at the head of the African Centre for Cities; Nick Shepherd, a star archaeologist and Africanist, and dance doyen Jay Pather, currently at the head of the National Arts Festival in Grahamstown and of Infecting the City in our town. On a platform encompassing such depth and breadth of intellect and practical experience, some stark contrasts were drawn, although there was a certain consensus on the gravity of the challenges facing architecture if it is to live up to its potential. Noero, for one, underlined a concern of long standing with him: the profession of Architecture, as he sees it, remains caught between a clumsy kind of social work (done by buildings and well-meaning architects rather than the relevant, trained professionals of the caring professions) and the architectural excesses (of degree, of scale, of taste) that have so discredited Architecture in the eyes of the public. Calling for work to be better grounded in reality and in lived spatial practice, and not built for some abstract imagined future, Noero called again on the assembled architects and on those they can reach to look to life itself, and not theory, as the driver of design. He also underlined what architects lose by not engaging as equals with artists, who make the forensic study of everyday life in all its ramifications their especial focus. In this regard, Nick Shepherd made an interesting contribution in his description of the process behind the Prestwich site remains (where a major mass grave was discovered and commemorated) as an example of how shallow and barren of imagination is our engagement with Cape Town’s dank and extensive caverns of collective memory. Those in doubt were invited to visit Truth, a coffee shop at the Prestwich Memorial, where the memories and physical remains of the unnamed dead may be perused over a steeply-priced latte. This was but one example of his chief assertion that Time, in a disjunctive city like ours, is anything but a simple line. He spoke convincingly of Cape Town as a haunted city, in which the past, frequently repressed by those cowed by the special complexity and forethought that history like ours demands of the practitioner, keeps coming back in uncanny but disarming ways. 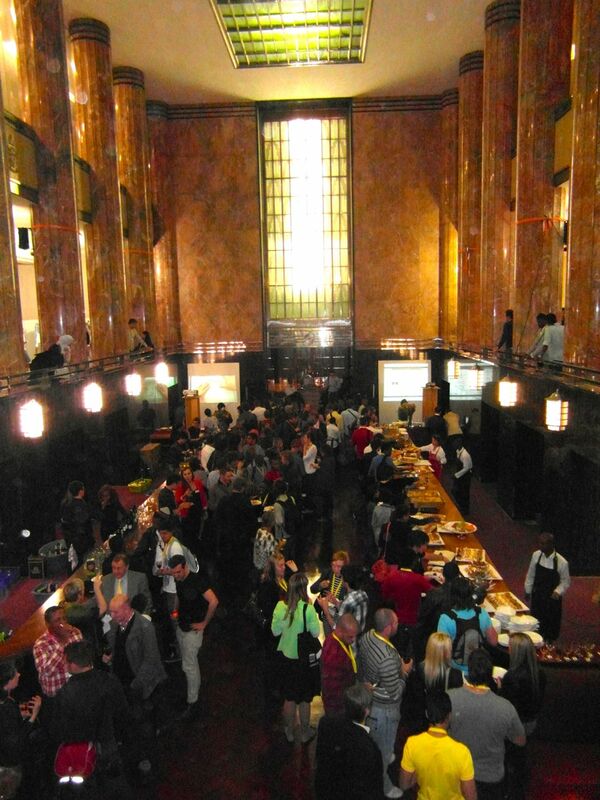 The Old Mutual Banking Hall filled with students and exhibits for the Des Baker Student Architecture Award. Des Baker is the country’s most important architecture award for which only 3rd year students at Universities and Technicons may be eligible. The night rolled on into drinks and talks and A0 prints at the Des Baker student awards, (for third-year students only) held to spectacular effect at Mutual Heights in the criminally-underused function room. 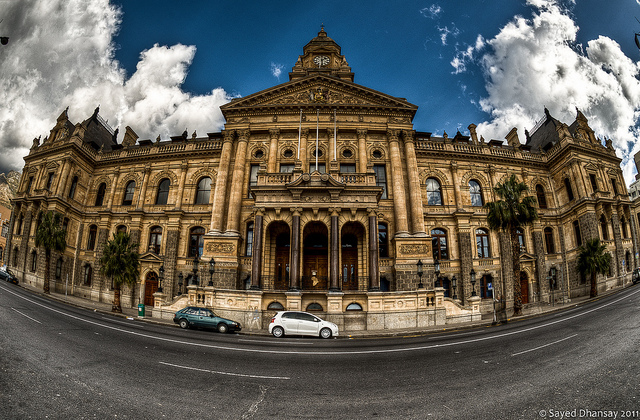 The pictures that follow are some highlights of the student work produced, for which the R50 000 prize money for 2012 was, in a radical and unprecedented move, split evenly three ways at the judge’s insistence. Pretoria swept the boards, of which two went to Tuks and one to the Tshwane University of Technology. 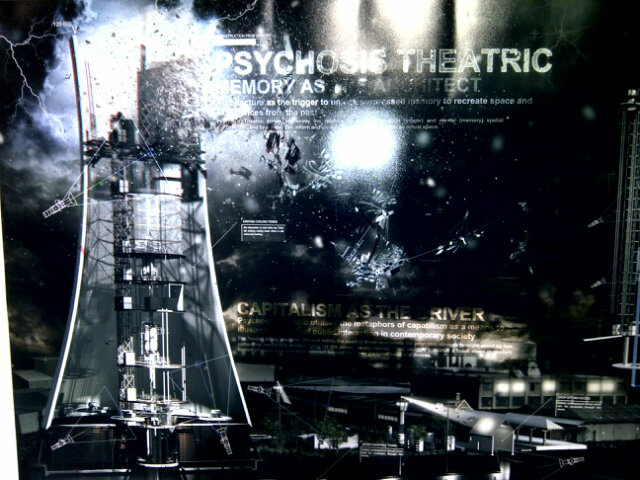 “Psychosis Theatric” (Tuks) channels the Freudian subconscious as driver of form. 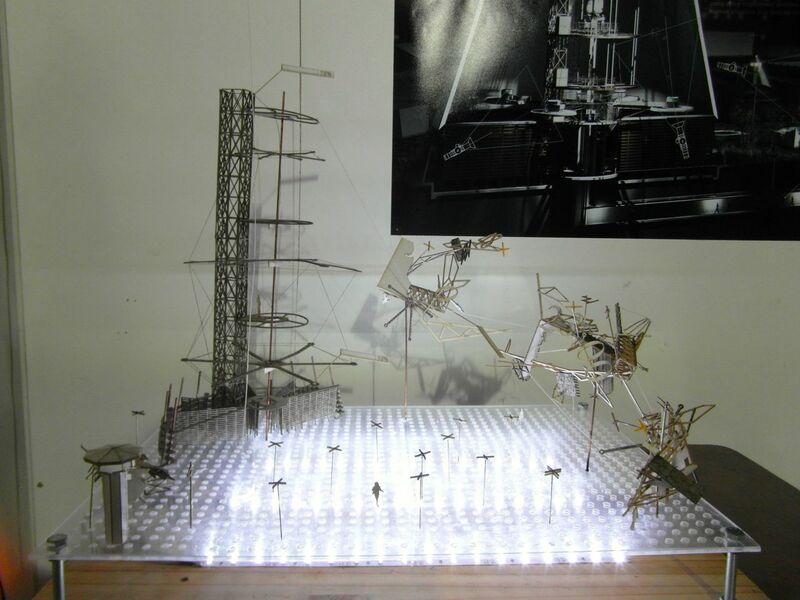 Model of “Psychosis Theatric” by Tuks which won a Des Baker award. 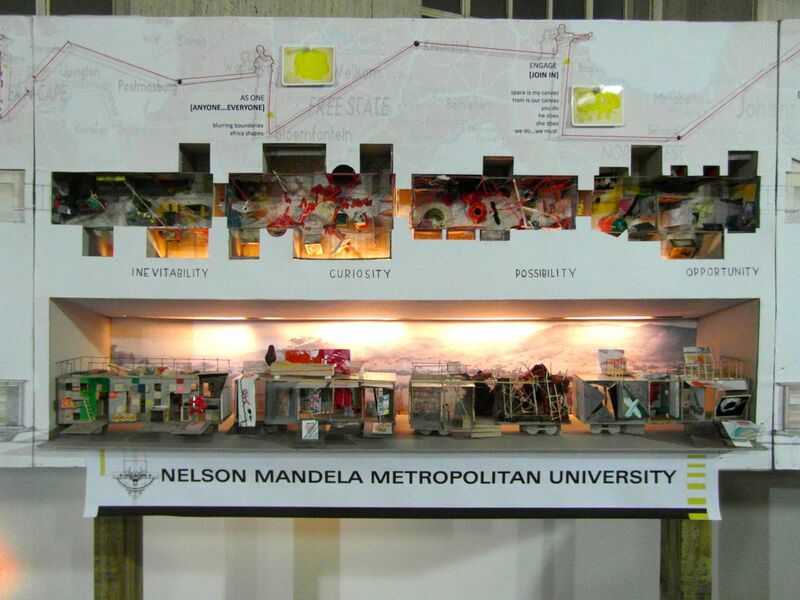 “Exhibit”, from NMMU, harnesses the railways to make a rolling suburb.